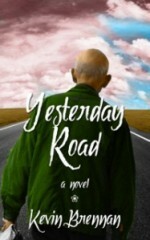 Yesterday Road for 99 cents? You betta believe it, baby! The sale runs through 6/27, but it doesn’t begin officially till next Friday. You, my devoted readers here at What The Hell, get first crack, so if you’ve been waiting for that perfect price point and you have a spare dollar in your virtual coin pouch, it’s time to pull the trigger. This is also the last promotion I’ll be doing for YR before the publication of Wish I Were Here in September. After 6/27, the price returns to $4.99. This entry was posted in Writers Helping Writers and tagged 99 cents, Amazon reviews are manna, Book Promotion, buy now, fiction, Kevin Brennan, novel, review now, What the Hell, writing, Yesterday Road. Bookmark the permalink. 2 Responses to Yesterday Road for 99 cents? You betta believe it, baby!